Mother Chitta (Back To Work Long Distance Gallop) Registration number: SE48188/2014) 57 cm tall, 28 kg. Health results: HD: A, eyes clear, ED: O, PN free by parents. Temperament: Good temperamented and social dog, sweet to people, rather dominant towards other females but no trouble maker. Selfsure and outgoing female. 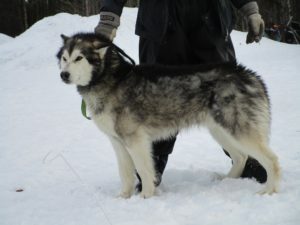 Working results: She did 2 seasons mid distance training and tourist tours at Laplands Wolftrail . She has a high will to go and high working drive. Uses all gaits. Good focused worker, also uphill and in deap snow. She runs more in front of the team but not really a leader. Father, Tiguaq’s Pok Nathey (Bill). Born 15/10/2014. SE38459/2016. 61 cm at shoulders, 28 kg. Health results: Hips: A, Elbows: 0, Eyes clear, PN: free by parents. Working results: Many mid distance tourist tours at Laplands Wolftrail. Finished 300 km at the Gold Rush Run 2017 and 2018. Working trotting speed 10-18 km/hour. Non aggressive male, Leaddog/swingdog. High drive. Good feet. Good trotter. 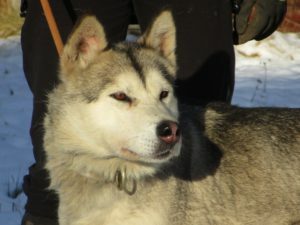 All puppys found a home at other Alaskan Malamute kennels and/or mushers and active homes around Europe. Health results, working results and eventually show results will follow as soon as they appear. B litter: Born 17/12/2018 6 females and 4 males.